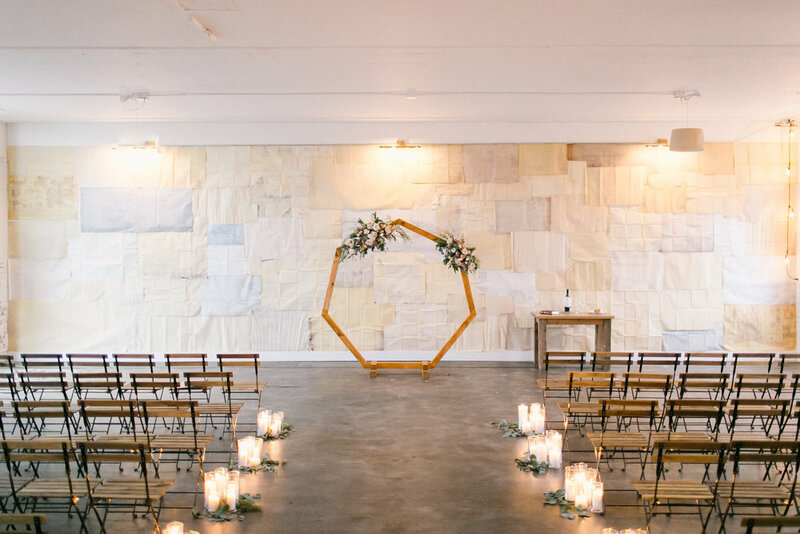 A classic venue - bright, airy and full of romance. An all new venue created with a clean, classic and artful approach. Located in the historic Clocktower at Northern Pacific Center in Brainerd, Minnesota, Luminary Fern is the perfect blank space for your wedding. With a 170 guest capacity for seated receptions and 300 guest capacity for stadium style ceremonies we are the perfect location for intimate to mid-sized weddings. 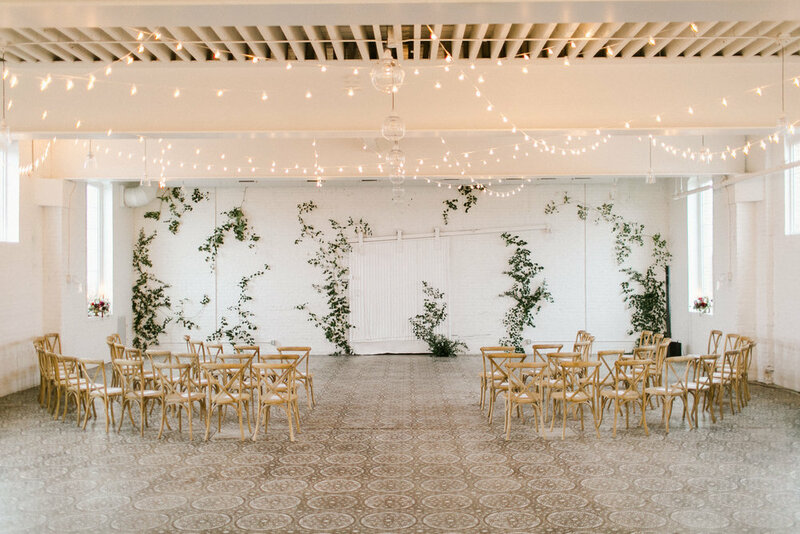 There’s no carpet or dark rooms here - our historic railroad building industrial backdrop is mixed with perfect amount of romantic estate details making Luminary Fern the dreamiest location in the Brainerd Lakes area. Our site is heavy based on downward content, so keep scrolling down for more details. The light...ahh the light. We replaced all of the boarded up old window openings with new glass and added large double white entry doors. Fun fact - the front doors are off of the now gone 1800’s foundry and were retrofitted to work with our added entry. Let the light flow in! The brightness shines forward with our antique white sprayed wood and metal exposed beam ceiling, light-toned stenciled and polished concrete floor, and whitewashed original brick walls. We accented the ceiling with glass globe fixtures and draped cafe style string lights. While the main space is very much a clean slate, the restrooms and bar have unique fixtures, custom art backgrounds and more. And we can’t wait for you to take a walk in our restroom hall and smile at your beautiful face in one of our many mirrors - an area of enjoyment for many guests! Above rental rates include six wood farmhouse style tables (seats 8), 5' round tables (seats 8), 8' rectangle banquet tables (seats 8), 3 - 30" round cocktail height tables, choice of seating for up to 170 guests (White Chiavari Chair, Warm Brown Vineyard Chair, or Metal/Wood Bistro Chair. White polyester floor length linens are included for 5’ round tables and upgrades are also available. Venue Rental is for 12 hours (typically noon to midnight, but can be specific to each couple). Additional setup hours for vendor setup and decorating are $150 per hour. Setup and Cleanup must be completed within rented time. Friday, Saturday and Sunday reception rentals include up to 8 hours for active event with remaining hours for setup and cleanup. Venue Rental is for the space within 1561 Northern Pacific Road. Other spaces and ceremony sites are in addition to the venue itself. Looking to rent for a non-profit or charitable organization? Contact us for booking discounts. Add-on ceremony rates for Luminary Fern Reception bookings are as follows. Note all listed options below are based on availability. Rental includes setup, ceremony and teardown and within the listed time frame as well as seating (chiavari, bistro or vineyard chairs). *Room Flip - our team brings out tables and resets room based on room diagram. We will roll out two temporary walls to partially block guest view during cocktail hour. Note that the caterer will need to set glassware/plates/flatware and florist and/or decorator will need to return to set on tables. Are you having your reception at The NP Event Space and want to book Luminary Fern for your ceremony, cocktail hour or both? Click HERE. Our brides deserve the most beautiful place around to get ready. At just under 2,000 square feet, The Loft Studio Suite was originally Aimee Jobe’s natural light photo studio and now hosts our lovely brides and her closest gals on the wedding day. Enjoy the blissful moments before your ceremony surrounded in a beautiful space. New for 2019 and beyond - we’ve added a second bridal suite! While it’s a little bit more petite, it’s character and charm make Loft WEST the perfect backdrop for getting ready on your big day! Please note these prices only apply to couples who are booking Luminary Fern. Also, the suite must be completely emptied at the end of the hourly rental due to personal property liability. We have a pretty awesome collection of things. Not going to lie...we love to shop and find unique decor. And someone may have a bit of a problem around here with chandeliers - and accumulation of them (cough, Aimee, cough). Full rental catalog coming soon including furniture, chandeliers, dance floor, farmhouse tables, photo booth, uplighting, draping, arbors and arches. Can't find what you are looking for in our favorite things? Check out below for some awesome vendors who have amazing things as well. And keep checking back as we add things to our collection weekly.